Launched in September 2014 by artist/engineer Dan Morrison, BLOTT WORKS is a wonderland of incredible creations, including lamps, clocks and plant displays. This stunning Hawk mechanical desk lamp is both a work lamp and a decorative bird sculpture. It’s one of a hand-engineered limited-edition of 100, costing £1,750 each. "After a career that has seen him work as an engineer, a designer and a funeral director, Dan Morrison has discovered his true vocation"
"I’m someone who absorbs the world around them, enjoying being surprised by the ideas that surface. I work by the layering of disparate things, like a flower and a flame, or a bird and crane. But inevitably I only discover these influences after I’ve started. I thrive on the overlaps and the gaps between things and love designing things that resonate on multiple levels." "We were delighted to select Dan Morrison's BLOTT WORKS for our Award at the GNCCF last autumn, his extraordinary limited edition, hand engineered, functional sculptures are fascinating, intriguing and very clever indeed! 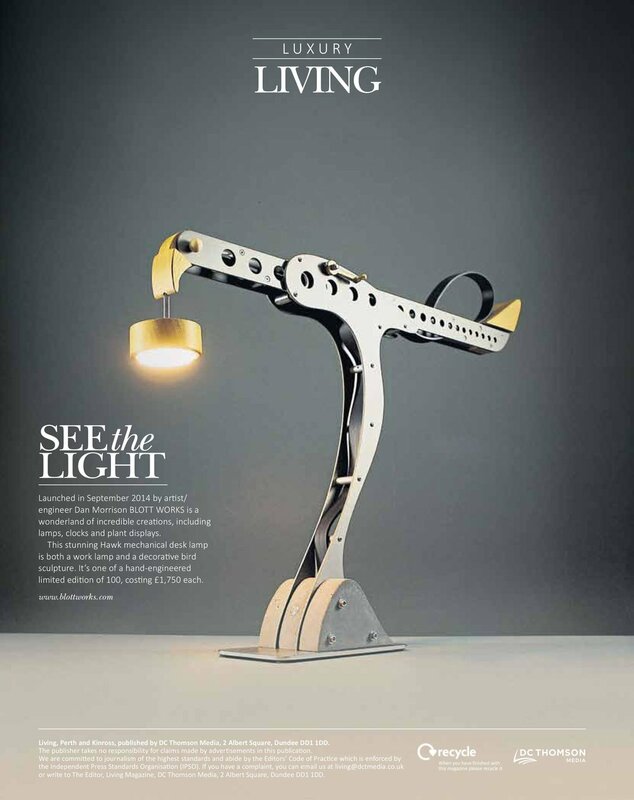 BLOTT WORKS is like nothing we've ever seen before"
Very pleased that our Clamshell Alchemist lamp featured in the Luxury Gift section in Stuff magazine recently. As an extra bonus we get to use this photograph (below) beautifully taken by Pete Gardner in his Chelsea studio.